My name is Chuck Iker. 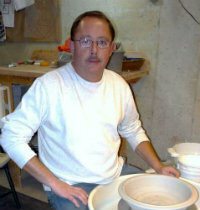 I am a ceramic artist from Batavia, Ohio. I make and sell wheel thrown and hand built Bonsai Pots. All of my work is individually handcrafted so that no two pieces are ever exactly alike. I never mold, cast or jigger so production is limited and exclusive. An Iker Bonsai Pot is truly a one of a kind piece. My work is influenced by a 20 year background in functional and artistic pottery and a decade’s long appreciation for the art of bonsai. My pots are vessels for the art of bonsai. I handcraft each piece with a focus on fit within in your bonsai composition. I provide options from traditional to primitive, glazed and unglazed. I find elegance in simplistic geometry so my work tends to follow a deliberate cleanliness of form. The bonsai pot is a complimentary element of the bonsai landscape. It should bring visual harmony to the overall piece in both tone and form. Due to the specific design elements of a bonsai pot the demands on the clay body are unique to other ceramics. The added features of drainage, wire holes and wide flat forms requires a clay body that will not crack, split or warp at surface transitions. The clay body must vitrify at firing to ensure the pot is frost proof. I custom mix all of my stoneware clay bodies. Additions of kyanite and grogs are added depending upon form size and finish. Most of my glazes are my own formula developed to replicate organic and natural finishes. I enjoy fluid glazes that burn on surface transitions revealing the beauty of the underlying clay body and pool with deep, rich organic tones. Completely lead-free glazes ensure safety for both handling and your trees. I also use a variety of custom blended clay slips and oxide washes for color and surface development on my unglazed work. I properly finish and trim all pots so that every bonsai pot functions as required. You will not find untrimmed bottoms on any of my pots. Drainage holes and wire tie holes are proper for the shape and function. My pots are glazed only on the exterior. All of my work is signed, dated, numbered and cataloged. My studio is located at my home in Southeast Ohio along the East Fork River. After years of working in community studio space I have settled in a comfortable and inspiring private studio. Pottery can be a solitary and personal activity; having your own studio space and the equipment to work without restriction allows the greatest freedom to create. I work hard to keep Iker Bonsai Pots an artistic and enjoyable endeavor. I will settle for nothing less than the highest level of business integrity and customer satisfaction. My ceramics are shipped with largely recycled materials. I collect post-consumer boxes and packing materials from several local businesses. I work to maintain a high degree of business ethics. I take as much pride in the way I do business as the pots I make. A broken pot can be remade, a broken relationship is hard to mend. It is my hope that my work will find its way into your collection. I am honored and gratified when my pottery becomes part of another artist's vision. I fire several times per month so check back often.